When you choose to forgo the traditional June wedding and hold your nuptials in October instead, you’ve chosen the perfect time to embrace a Halloween wedding theme. Whether you long for a cool, elegant affair or a fun, funky party, a Halloween wedding offers you the chance to express yourself in an unusual way. From creepy decorations to terrific treats, you can make your Hallowedding unforgettable. If you don’t know where to start, here are a few awesome Halloween wedding ideas you may want to try. If you don’t want to wear a spooky wedding dress, select wedding colors that simply shout Halloween. 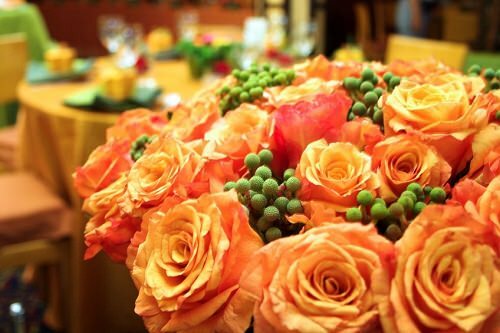 Choose from black, orange, russet, maroon, chocolate, peach or harvest gold to create that fall feeling. Adorn your wedding attendants in clothing that incorporates your Halloween wedding colors. Continue the theme throughout the event by picking décor for the wedding and reception venues that uses these colors as well.